A leg injury is typically caused by an unfortunate incident such as a fall, a slip, or a sporting mishap like the one illustrated below in a recent Yahoo! Sports news article. Initial treatment for a broken leg usually begins in a Cupertino urgent care clinic like U.S. HealthWorks Medical Group, where a doctor can evaluate the injury and perform the appropriate treatment for it. 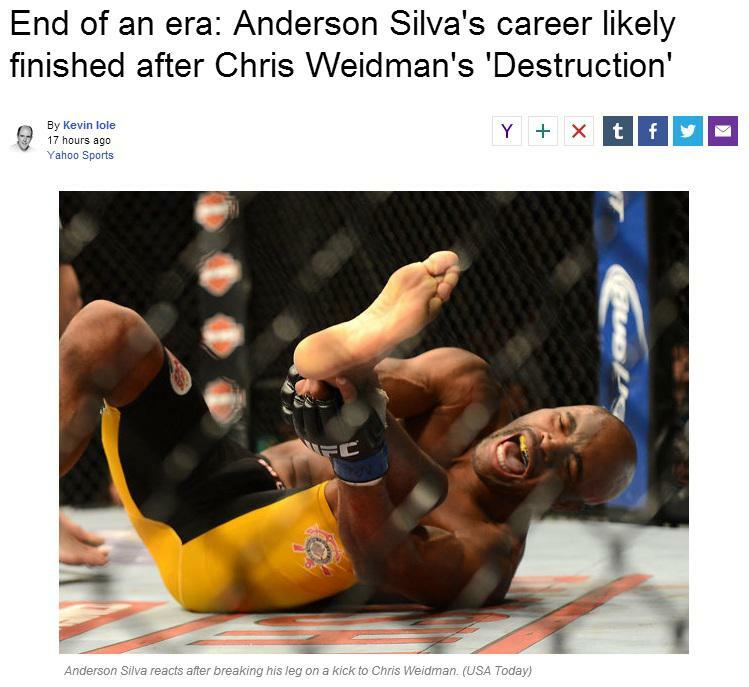 “During his seven-year UFC career, Anderson Silva did things in the cage that few men could do, or would dare try. On Saturday, Silva once again did something rarely seen, though this time; it was a gruesome injury he suffered that likely will end his masterful career. Silva broke his left leg while throwing a kick at middleweight champion Chris Weidman early in the second round of their rematch Saturday in the main event of UFC 168 at the sold-out MGM Grand Garden. Do not let the patient put any weight on the leg. If swelling develops, have the patient lie down to rest and elevate the injured leg on some pillows. If the patient needs to get up, have him use crutches. Ice can be used as an anti-inflammatory remedy. Apply ice on the injury for 20 minutes every hour until a doctor can take over. Prevent ice burns by placing a towel between the skin and the ice pack. When you take a leg injury patient to a Cupertino walk-in clinic for treatment, the attending physician will most likely require an X-ray to determine if there is a fracture. If a fracture is confirmed, the physician will determine if treatment can be given at home or if the patient needs to be admitted. Immobilization is the treatment for most leg injuries. However, surgery may be used to implant internal fixation devices such as screws and plates to keep the bones in place during healing.